Today my day started quite late as I am having stomach cramp T_T..huhu..mkn ubat n tros shahid sebentar. I am still feeling the dizziness ni..but updet blog bleh je=p ahaha.. So, I found the photos from my spa session. I chose a spa near to my home in PJ. The spa is located in PJ state, near to Assunta Hospital. Take a look at the room. The bed for the spa treatments. The session took 3 hours kot. Oh, the bed is blocking the bath tub la..every room has its own personal bath tub. Went there for 3 sessions. Spa treatments, facial, pedicure n manicure. I took a pre-wedding package. And tell u, it's worth it!! Don't do your spa treatment that late tau. For me, I did one day before my w-day which is sooo wrong. But for me, I enjoy doing it last minute cz the freshness that I felt stayed till d next day=p ahaah.. If u have extra budget for the spa, u are encouraged to take more than 1 session cz I think to really sees the effect, u might need more than 1 session. However for me, one session is enough dah;p ahahah.. The product used are from Indonesia. From mama Matilda ape tah. For the facial they used biokos. After each session, they'll serve u a cup of tea and a plate of watermelon. The tea sgt sedap T_T...It just calm u down after each session. I think it's part of the ritual kot. The place is gojes! !all in water..so, u'll walk in water tp atas batu la..haha..susah nk explain. please go to the website k.
Btw, before u go, u have to really make up ur mind which ritual do you guys wud like to try. It's all stated in the website. Better go faster cz they are in the process of naik harge after 6 years. Btw, you wont see the package that I took in the website cz I changed certain things in the package with a lil addition to the price shown. So, u may not necessarily have to follow the package provided. You still can negotiate about it with the owner, k. Gudluk! For b2b who's still considering spa treatment before the wedding, personally I think you should go. 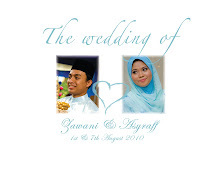 You can even ask your fiance to sponsor u. haha..cz after all the treatment pon for him kan=p ahaha.. Many people been asking, did u ever missed the moment when u do all the preps? ?